It’s been said Albert Einstein defined insanity as doing the same thing over and over again, and expecting a different result. 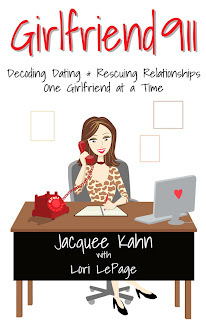 In her eye-opening book, Girlfriend 911, relationship “guru” Jacquee Kahn puts an end to the insanity with a step-by-step guide to rescuing relationships in trouble, and helping single women find and keep “Mr. Right.” Often referred to as the “Super Nanny for Women”—a nod to no-nonsense parenting expert Jo Frost—Kahn’s approach is concise, straight-forward, and backed by proven results. Based on years of helping her girlfriends (and their girlfriends, and their girlfriends, and so on) with all sorts of relationship woes, Kahn devised a “formula” for attracting and maintaining a healthy relationship. She details her secret formula in Girlfriend 911, and provides easy-to-follow instructions, fascinating relationship “case studies,” and extraordinary outcomes. 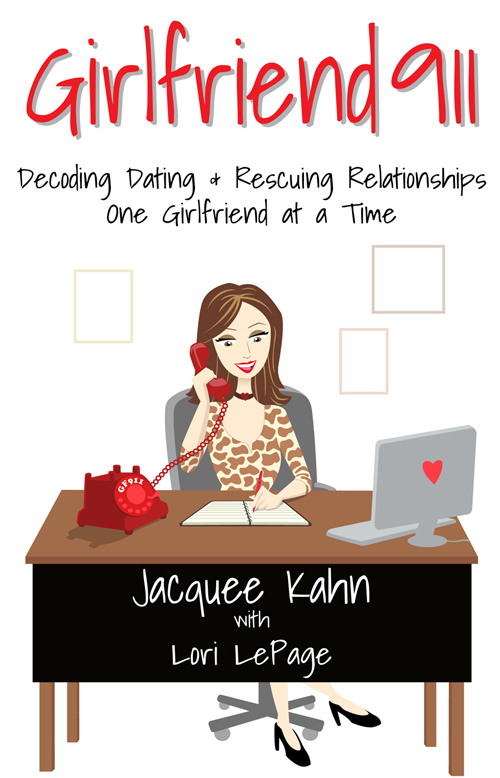 In relatable, girlfriend-to-girlfriend language Kahn exposes the root cause of relationship failure, and skillfully illustrates how immediate the results can be once you get with the program. Girlfriend 911 is the relationship bible no girlfriend should be without! Girlfriend 911 is an invaluable tool for any woman, regardless of her relationship status. Single, dating, in a relationship, and even married women can benefit enormously from the Girlfriend 911 program and the lessons contained within. “I ordered this book on the day it was available. I sat down and read it all in one sitting. It was so eye opening to realize all the things I need to change about the way I behave and the standards I need to set for myself. This is a must have for your survival to dating and a strong relationship! Thanks Girlfriend 911, I will keep you posted on the next relationship I enter into and how well I have used my new tools.” Laurie S.
“It’s amazing how much we women lower our standards for those we love. Jacquee understands how hard it is to breakup and reclaim self-worth. Girlfriend 911 gives you the tools to move forward. I am really excited that I get to start again and this time use Girlfriend 911 as my map to a healthy, committed, loving relationship. And yes, it has taken much longer than I would have hoped, but I realize now that I wasn’t ready for anything real before.” Hayley B. “I LOVE me some Girlfriend 911. I was introduced to the program when I was going through a broken engagement. It helped me see what I really wanted. By working the program I was able to focus and ask for what I needed. In the end that relationship wasn’t for me, but going through the program did bring the honesty and clarity I needed to move on with confidence. Now after a decade I'm back to dating. I keep in mind all the wonderful nuggets in Girlfriend 911, and have learned how to set and keep my boundaries. When I feel myself going astray I can easily thumb back through the book and remember all the simple, but truly golden, rules.” Jane M.
“This book has been invaluable in terms of recognizing all my past patterns of trying to force square pegs into round holes, and realizing that it really WAS my fault, but in all the best ways possible. I have the power, I just needed (and currently need) to always remember to hang on to it and not squander it away, leaving me only half of me. That will only get me half of what I want. This book also, rightly, eliminates the idea that you can ever be rejected or judged, it just really, clearly shows how all we are is love, and we deserve someone who wants and can give the same love we deserve. A break-up is not rejection if you’re going about it the Girlfriend 911 way, it just means you’re moving forward, closer to what you really deserve, and what will truly make you happy.” Erica C.
“After reading Girlfriend 911 and doing the program in this book, my relationship with myself has finally started to change. I really see how I repeat the same patterns in all of my relationships and always end up with the same results. Now in my marriage I am using the Girlfriend 911 approach. I finally feel good about myself and my relationship is changing as a result. There really is nothing like this book. Jacquee Kahn has a true gift. She really understands relationships and how to heal them! Her philosophy is simple; change your behavior, stay connected to your True Self, and everything will fall into place.” Paula B.
surprising what will unfold. For me it’s 100 times more than you can ever imagine is possible.” Tammy P.
“In no uncertain terms, this book has CHANGED MY LIFE! Before reading Girlfriend 911 I was on an emotional rollercoaster with my relationship. I was literally in a tumultuous relationship that could have gone on for years! At the point in my life I discovered the Girlfriend 911 “program,” I was at an all-time emotional low. I figured nothing I had done previously had been working, so I was ready to try something different. This book pointed out to me very clearly what I was doing wrong. GF911 helped me get back my power, self confidence, self respect, and establish boundaries with men. It has also helped in so many other types of relationships. It is my daily “mantra” and when I get a little off track, I always refer back to it, because it works!” Belinda J.